There's celebration in the air as we’ve just learned of our Impact Awards Graphic Design win and honourable mention for our Inbound Growth Story submission. The annual HubSpot Impact Awards, awards 2 rounds of wins across 5 different categories, namely, Website Design, Graphic Design, Sales Enablement, Integrations Innovation and Inbound Growth Story. Winners from each round are entered as finalists for the Impact Awards Grand Prize which is awarded at the INBOUND annual conferences. Having just completed a very compelling content offer for our client Bridge, we jumped at the opportunity to showcase this extremely well-designed offer under the Graphic Design category. While we were analysing exactly how much of an impact this content made, along with how well the brand has grown with us – we proceeded to enter our Inbound Marketing work with Bridge, under the Inbound Growth Story category as well. Our latest content offer for Bridge was aimed at enticing commissioners and relaying a story that readers could relate to by highlighting the impact they could make in someone else's life. Our content writer and designer, Lizette Louw and Brian Ackerman, came up with an interactive eBook with a 'choose your own ending' theme. The compelling content was supplemented with touching imagery that tugged at the heart of how isolated many mental health sufferers feel. Donors could then complete a donation through strategically placed CTAs, and although the campaign was aimed at enticing commissioners to join the Bridge Commissioner's Network, it's appeal could no doubt reach a wide array of personas. Creative design backed with a genuine sensitivity regarding imagery and story, lead us to enter this content as our Graphic Design Impact Award submission. Read about what went into creating this fantastic piece of content from the writer herself. Charged with appealing to very contrasting personas, our marketing work on the Bridge website took on many different angles to appeal to these various audiences. Our onsite optimisation meant that the brand's approach to acquiring donors and serving the mental health community would be more streamlined, and with targeted marketing resources and content, we served to create awareness and combat stigma. Our February statistics showed considerable growth for the brand and optimisation on The UK Family's Pocket Guide to Common Mental Illnesses & Disorders content offer, saw the conversion rate nearly doubled. With all of these valuable metrics considerably moved, we felt we definitely had a winning story to tell. Read more about how we went about affecting change and implementing growth for the Bridge brand. "Struto has set an example for how businesses everywhere should be transforming their marketing with Inbound. Their strategic approach to attracting, engaging, and delighting customers has not only built valuable relationships with their audience, but has driven growth for their agency and the inbound movement. 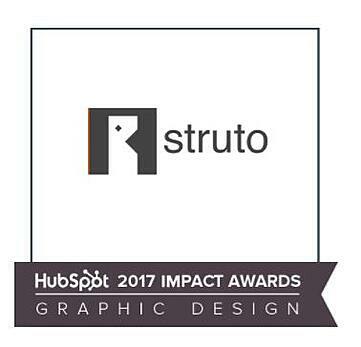 Our team here at HubSpot is proud to call Struto a Partner and recognise them with this award." - David McNeil, VP Global Partner Program and Strategy at HubSpot, Inc. Along with our win, and automatic Grand Prize entry, we'll also be featured in a "Best Of" compilation eBook which HubSpot will be releasing soon. Have a look at the HubSpot showcases page for all the winners in their respective categories. If you're interested in reaching some similar goals, have a talk to us about how our award-winning team can get your business achieving its very own wins. Our "secret sauce" of People, Processes and Technology is designed to suit every business and provides a solution that can help you.